How we train, behave, or do anything is the cumulation of all our experiences, how we perceive them, and are acquired after many years of conditioning. Philosopher Ernest Holmes wrote, "Never limit your view of life by any past experience. The possibility of life is inherent with the capacity to imagine what life is, backed by the power to produce this imagery... conceive of it as already being an accomplished fact...". Whether you're testing for rank, competing in a tournament, or experimenting with some seemingly impossible new technique, it's imperative to see yourself accomplishing your goal to it's conclusion. Willpower and determination isn't enough; we must combine these attributes with a proper vision. Kata is the classic expression of imagery at work in the martial arts. The "imaginary" opponents within the form must be regarded as quite real. A good instructor will tell you to envision striking through a target, not simply at it. When Musashi said to "...see yourself as larger than your adversary", he was referring to creative visualization, not wishful thinking. Trying implies that failure is an option. The power of focused imagery gives us access to all the limitless options available to us. Great post, thank you. I love that you connect willpower with 'proper vision'. That's one of the things I just love about the Martial Arts - all the things they teach you about life and about yourself! Doing a form is like moving through life itself, one moment leading to the next. I read somewhere that the forms are, in a sense, the 'purest' moment of any Martial Art, because your opponent is essentially yourself. That's why doing them can teach you so much about yourself, your willpower and your vision. As I'm new here, just wanted to say, reading through all the posts and comments has just been great. I'm training on my own at the moment (mentioned earlier on the Solitude post) and this has really helped me feel inspired and connected again. Hello again, KFG. 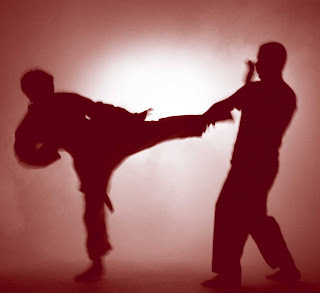 Originally, kata (forms) practice was the considered the essence and primary method of training in the martial arts. Many consider kata as a "moving" meditation of sorts. Thank you again for stopping by, and especially for your kind words. "see yourself as larger than your adversary"
My instructor often tells us the story about her instructor. She was walking on a dark college campus and some guys were walking near her and she felt they were up to no good. She stopped and stood up as tall as she could. (She's only about 5' tall) and the guys visibly backed away from her. They're lucky too, because from what I hear she is very good. Great post, with lots of good things to think about. There was a woman in the school I used to train at (a black belt) who was 4'7". Never judge a book by its cover. And as to trying, I am reminded of the great and wise Yoda, "DO or DO NOT, there is NO try..." Funny enough to quote Yoda, but the philosophy is indeed correct. There's a nice link to make between what you write here and what Supergroup7 wrote on her blog. Survival. The hard part, for me while training, is attaining that state of mind. Because of the relative safety in the dojo. I constantly have to remind myself that the person in front of me, while a co-student, represents a person wanting my life. And, that I have to stop him. That I have already stopped him. Live doing, or die trying. Where did I hear : "even close, if it's missed, it's not done". Bruce Lee makes a similar statement in his book and so does Tokitsu. Countless master emphasize the importance of doing. And, are you sure it wasn't just wishful thinking? I think this is what the characters in Hero were doing during those long breaks before the actual combat. I like to visualize my opponents as engines and myself as the disassembling mechanic.